The number of confirmed exoplanets on exoplanets.org is up to 684. But how many of those planets could actually harbor life? We can estimate which exoplanets could support life by making the assumption that life requires the presence of liquid water. The habitable zone of a star describes the range of distances to the star in which a planet could orbit and still have liquid surface water. If the planet gets too close to its star, water is lost due to high temperatures. If the planet gets too far away, temperatures are so low that the water freezes. We’ve talked about habitable zones quite a bit here on astrobites, including the habitable zones around binary stars and brown and white dwarfs , and the habitability of rogue planets. If we’re looking for extraterrestrial life, the next step is determining how many of the currently-known exoplanets orbit in the habitable zones of their stars. But where exactly is the habitable zone for a given star? Most current estimates of habitable zone boundaries use a planetary climate model by Kasting et al. (1993). In this paper, some of the original authors of the Kasting paper join with new researchers to improve the model and find new boundaries for the habitable zone in our Solar System and around other stars. These improved estimates of habitable zone boundaries will allow us to determine which known exoplanets orbit in the habitable zones of their stars, which narrows down the list of which planets which should observe more closely for signs of life. The habitable zone is traditionally defined for an Earth-mass planet with an atmosphere of carbon dioxide, water, and nitrogen. In the 1-D model described by this paper, the model planet’s atmosphere is divided into 101 vertical layers. The model calculates the solar flux necessary to produce a given surface temperature, based on radiative transfer within the atmosphere. Model planets with CO2-rich atmospheres are used to study the outer edge of the habitable zone. These planets can keep their surfaces warm further from the star due to the greenhouse effect, but eventually the CO2 will condense out of the atmosphere and form clouds, which block the light from the star and cool the surface. Model planets with H2O-rich atmospheres are used to study the inner edge of the habitable zone. At high temperatures, much of the water exists in the atmosphere, where is lost when incoming photons break apart the H2O molecules (via photolysis), allowing hydrogen to escape. 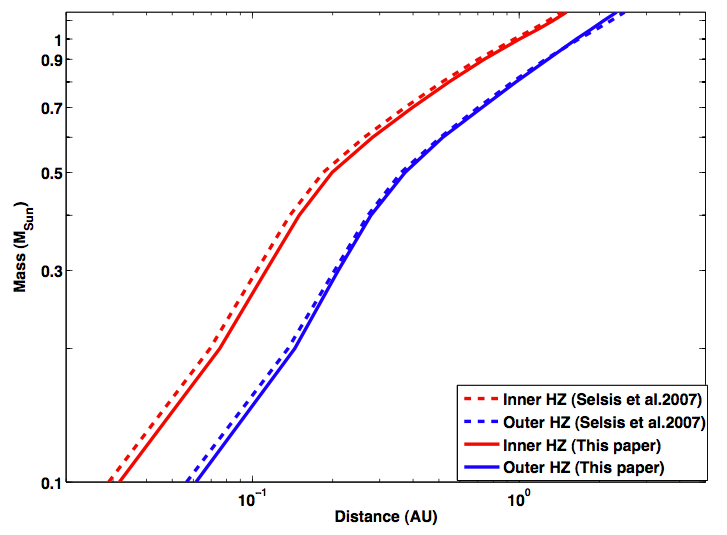 The original climate model from Kasting et al (1993) estimated that the inner and outer edges of the Solar System habitable zone are located at 0.95 and 1.67 AU, respectively. The authors of this paper update the model by including Rayleigh scattering by water vapor, new absorption coefficients for H2O and CO2, and new heat capacity relationships for H2O and CO2. They test and verify the updated model by comparing their results with the SMART model by D. Crisp (see Meadows & Crisp 1996). Fig 1: The estimates of the boundaries of the habitable zone from this paper compared with a previous model, for different stellar masses. The authors are able to estimate new boundaries for the habitable zone around a Sun-like star. The result is a range of 0.99-1.70 AU for a 1 Solar-mass star (see Fig 1), meaning that the Earth is just barely inside the habitable zone of the Sun! But you don’t need to worry too much — this model ignores the effects of water clouds, which reflect some of the light from the Sun and cool the Earth’s surface, pushing the inner edge of the habitable zone further in. The authors also explore the habitable zone ranges for smaller (1 Mars mass) and larger (10 Earth mass) planets. Finally, they apply their model to stars of different spectral types by assuming different stellar temperatures, which imply different solar flux values at a given distance from the star. This allows them to discuss the possibility that certain recently-discovered exoplanets orbit in their stars’ habitable zones (see Fig 2). These new habitable zone estimates will give us a better idea of which exoplanets to follow up with detailed study as we search for habitable worlds beyond Earth. Fig 2: Stellar temperature vs. flux at the planet for Earth and several known exoplanets (plotted with various symbols). 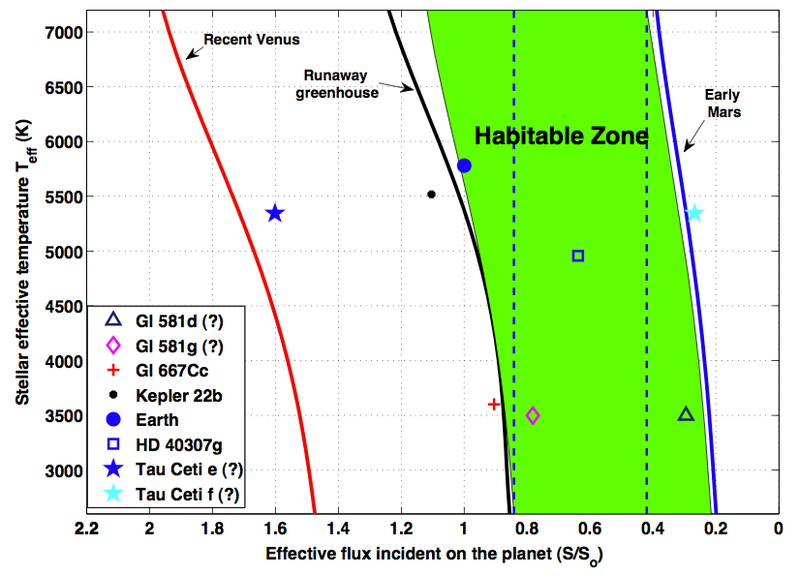 The shaded green area indicates the boundaries of the habitable zone estimated by this paper. A planet between the dashed lines will be in the habitable zone no matter what the stellar spectral type is. The "early Mars" line is a less conservative outer boundary based on the hypothesis that Mars used to be warm enough to have liquid surface water. The "runaway greenhouse" line is a less conservative inner boundary at which the liquid surface water has completely evaporated. The "recent Venus" line is an even more liberal inner boundary based on the assumption that Venus used to have liquid water and the observation that Venus has been dry for the last 1 Gyr. Are Extrasolar Worlds More Likely to Be Water-rich? How Hot is Too Hot? Evaporating Envelopes for Earth-like Results TRAPPIST-1: Just right?